Jan fittingly brought a Chambolle-Musigny, "La Combe d'Orveau" 2009 from Anne Gros. I say fittingly, because Jan has worked several seasons picking grapes for Anne Gros and knows her and her wines well. But not only that, Anne Gros is one of the few Burgundian producers who has also expanded to the Languedoc, to Cazelles in the Minervois. The Chambolle is a beautiful, seductive and elegant Pinot, a feminine wine I would say, with a hint of licorice behind the red fruit, and sublimely integrated oak with a light pepper in the aftertaste. A classic and beautiful red Burgundy, with 13% alcohol. I provided the next two bottles. First, the Côteaux du Languedoc, Mas des Dames "L'Unique" is indeed unique, as only 666 bottles are made after aging three years in a 500 liter barrique. Only the best Syrah and Grenache grapes are used, at yields of 25 hl/ha. What a change of gears here, very deeply concentrated dark fruits and also an intriguing barnyard note. Silky texture in the mouth with powerful tannins, a well balanced, powerful and truly Languedoc wine, with 13.5% alcohol. Next, the most atypical wine, the VDP de l'Herault, Mas de Daumas Gassac 2007. In retrospect, I should have served this before l'Unique, as this is a leaner, less robust wine made from 80% Cabernet Sauvignon and 20% "Variétés rares," whatever that may be. 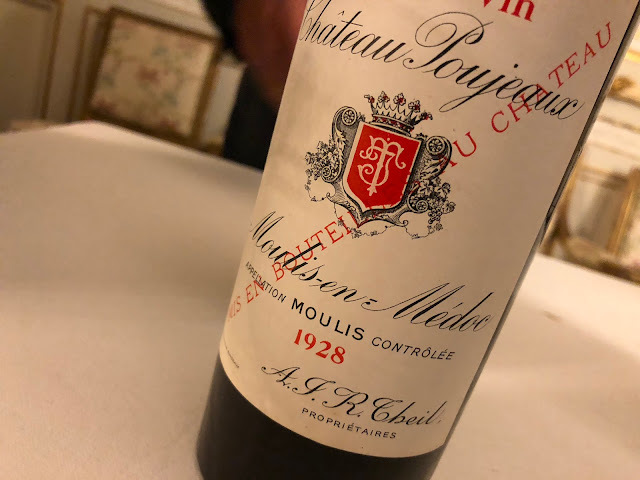 According to winemaker Samuel Guibert, "We belong more to the Bordeaux 1961 attitude—wine with 12.5% alcohol and good acidity. Only 15% new oak is used to get finesse. 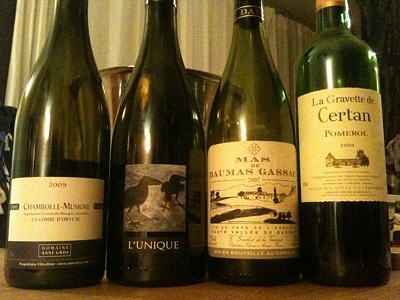 The wine is no more typical of Bordeaux than it is Languedoc." This is a very expressive wine which may yet in some ways be compared with Bordeaux, with darker notes of coffee and toast with different tannins than the Syrah, well balanced with good acidity. Finally, it was time to try David's bottle, the Pomerol, La Gravette de Certan 2009. This is the second wine from Vieux Château Certan, still a young vintage with 14% alcohol, though you wouldn’t notice it in the very user-friendly taste. Super elegant, fruit driven (both red and dark berries) with softer, melted tannins held up by upright acidity. There is a beautifully integrated use of wood, not overdone but showing notes of tobacco and spice. The wine remains elegant yet gripping in a quite long, fresh and fruity aftertaste. A truly beautiful right-bank specimen which will only gain more complexity with some bottle ageing. After tasting, we start drinking. Some cheeses and dry sausages are brought out, and I notice that the Pomerol is the first to disappear. But all of these wines are beautiful representatives of their genres; it gives us more pleasure to enjoy them instead of compare them.